Accepted Scientific Name: Glottiphyllum depressum (Haw.) N.E.Br. SB655 (Collector Steven Brack)Ecotype from Springfontein, Little Karoo, South Cape Province, South Africa. Origin and Habitat: Glottiphyllum muirii was originally found near Phisantefontein in the Little Karroo, Riversdale Div. (Cape Province) South Africa. Habitat and ecology: This species grows in barren-looking areas on vertical clay slate covered with white quartz scree, slightly sloping and, as a result of the run-off of rainwater, very dry. Accompanying succulent species can be: Crassula columnaris, Gibbaeum pubescens, Euphorbia susannae, Cotyledon wallichii, Cotyledon reticulata, Anacampseros papyrifera, Hereroa odorata, Conophytum muirii, Ruschia karolii, and Pelargonium sericeum. Mesembryanthemum depressum var. lividum Haw. Mesembryanthemum depressum var. pallens Haw. Mesembryanthemum longum var. angustius Haw. Mesembryanthemum longum var. declive Haw. Mesembryanthemum longum var. flaccidum Haw. Mesembryanthemum longum var. purpurascens Haw. Mesembryanthemum linguaeforme var. rufescens Haw. Description: Glottiphyllum muirii is one of the innumerable geographical forms of Glottiphyllum depressum which is one of the most widespread and morphologically variable taxon. 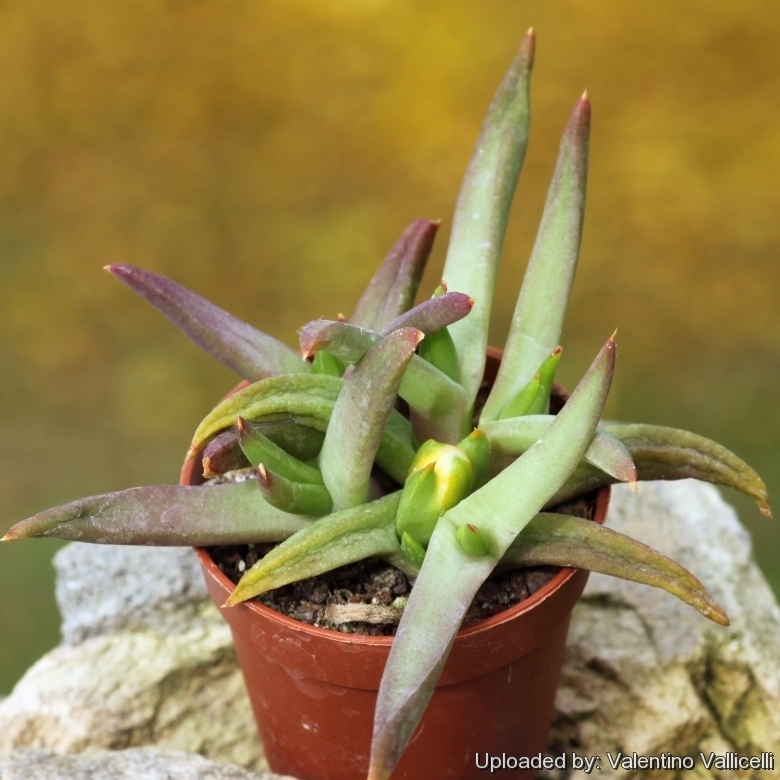 It is a small succulent, forming compact moderately branched groups of low, clustered rosettes with narrow strap-shaped leaves curving upwards at the tip to a blunt hook. The names Glottiphyllum muirii is not accepted by many botanists that treat it as synonym, but it still has a value for a collector because they identify plants with particular characters. Leaves: In 2 ranks. 6.5-9 (but occasionally up to 15) cm long, 1.5-2 cm wide. 1-1.1 cm thick, strap-shaped, spreading, more or less sloping downward or curving upwards at the tip to a blunt hook, rounded on the back, grass green. Given a very bright position, the leaves are grey-green with red and purple. Flowers: Sessile (stalkless), 6.5-7 cm in diameter. Petals pale yellow. Chromosome number: 2n = 18. Glottiphyllum depressum (Haw.) N.E.Br. : forms branched groups of low, clustered rosettes with narrow tongue or strap-shaped leaves, variation is considerable. Distribution: From Ceres to Uniondale,Western Cape, South Africa. Glottiphyllum muirii N.E.Br. : has narrow strap-shaped leaves curving upwards at the tip to a blunt hook, rounded on the back. Phisantefontein, Little Karroo, (Cape Province) South Africa. 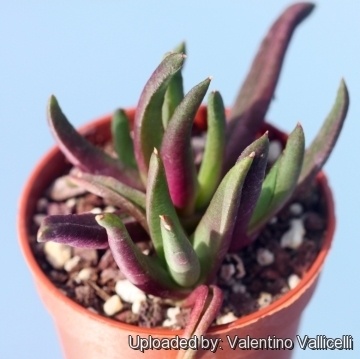 Cultivation and Propagation: The plants in this genus represent some of the more easily cultivated succulent species. Their main growth period is in late winter and were heading for spring-summer dormancy, but they do best with at least a little water all year. Requires little water otherwise their epidermis breaks (resulting in unsightly scars). Water moderately from the middle of summer to the end of winter, and keep the compost almost dry when the plants are dormant. Water minimally in spring and summer, only when the plant starts shrivelling (, but they will generally grow even in summer if given water) In areas prone to frost, grow in an intermediate greenhouse or conservatory, in pots of cactus compost, obtainable from good garden centres. Keep cool and shaded in summer, but provide maximum light the rest of the year. Remember that a sunny locality is best, otherwise they will not flower properly. However there are two ways to grow glottiphyllums: The first is to let nature take her course, which means giving them large pots and copious water; they will burgeon into enormous masses of glistening green leaves. The other is to starve them into svelteness by hot summer droughts, small pots, and firm loam. The results can be very attractive. In any case it is best to treat them as late winter growers. Soft leaves mean easy to damage. May be susceptible to mealybugs. Propagation: Seeds or cuttings. Seeds germinate very easily and can be sown in early to mid-spring, but can be sown at most times of the year (Avoid very hot weather in summer) and germinated in heated humid environment. Do not sow the seeds too deep. If sown too deep, they will be smothered and probably not germinate. Under ideal conditions, seedlings will grow rapidly. Plant the seedlings out when they are 3–5 cm in height. Alternatively, use stem cuttings taken towards the end of summer in an heated propagating case (15-21°C) Cuttings root easily and remain true to the species, while seeds tend to hybridize.